A trip in 2007 to the Victorinox and Wenger factories in Switzerland by Young and his wife, Susan Whittlesey ’77, was the start of extensive research on the Swiss Army Knife (SAK to its legions of fans). The result is this comprehensive book, with photos and drawings by the author. 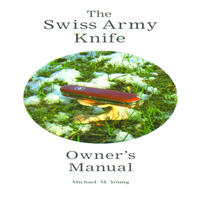 Included are chapters on the very differing histories of the two companies making the knife, the development of the various models and tools, improvised uses, repairs and modifications, and amazing stories of lives saved and situations resolved by the trusty Swiss Army Knife. ISBN-13: 978-0625503516. Published by Michael Young, 2011.